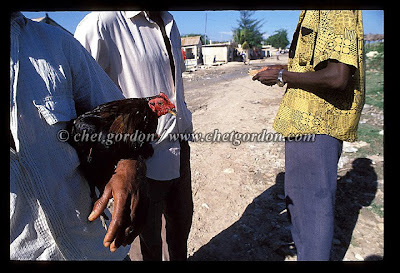 In October 1993 I traveled to Port-au-Prince, Haiti with two colleagues on my first personal international shooting trip. 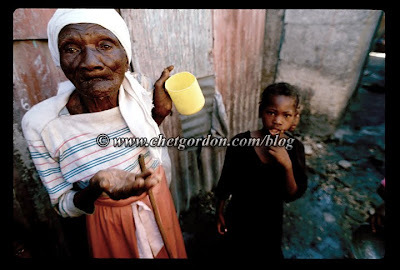 I remember walking the streets in Cite Soleil, Cite Carton,Bel Air, Delmas and of course Petionville. Working in Haiti on that first self assigned project changed my personal perspectives onapproaching long-term projects and of course working in a poverty stricken country. Six years later I returned with an NGO client and moved about the familiar neighborhoods. I know of the landmark buildings, like the Presidential Palace in central Port-au-Prince that have collapsed in this week’s earthquake. and down in the Gulf Coast States a few months after Hurricane Katrina, it’ll be a slow rebuilding process for this Caribbean country with it’s unimaginable living conditions, minimal infrastructure, and no economy to speak of. I am waiting to hear from colleagues working there and a few that are in transit now. Think of the people in Haiti and what they’re enduring now and what they’re faced with for the months, if not years to come. Cockfighters. Port-au-Prince, Haiti. October 1993. Presenting REWIND – Images from the Archive. I’ve thought for the longest time on how to showcase some of my favorite images here on the blog that aren’t particularly in the working portfolio for one reason or another. Look for this occasional feature where I’ll highlight a single image from the archives that’s meant a lot throughout my career. Enjoy. -cg. This entry was posted on Thursday, January 14th, 2010 at 5:39 AM. It is filed under REWIND and tagged with Haiti, Port-au-Prince, REWIND. You can follow any responses to this entry through the RSS 2.0 feed.